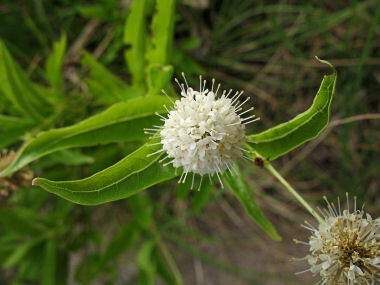 Buttonbush is a member of the Madder Family. It appears as a shrub or bush to 3 feet in height. It has shiny, dark green, lance shaped leaves with a prominent mid-vein that grow in groups of three to 5 inches in length and 2.5 inches in width. 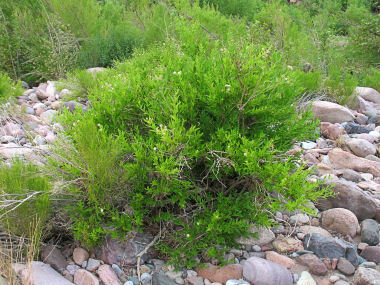 The plant grows near lakes and streams at elevations between 1000 - 5000 feet. Buttonbush blooms between June - September and produces tiny, white flowers with 4 lobes to 0.5 inches in length and 0.13 inches in width that grow in a ball shaped cluster. Flowers are followed by a button of seeds to 0.75 inches in diameter.